UNC Lineberger’s Patient Research Advocacy Group will help scientists and trainees to consider the patient perspective when conducting and presenting their research. 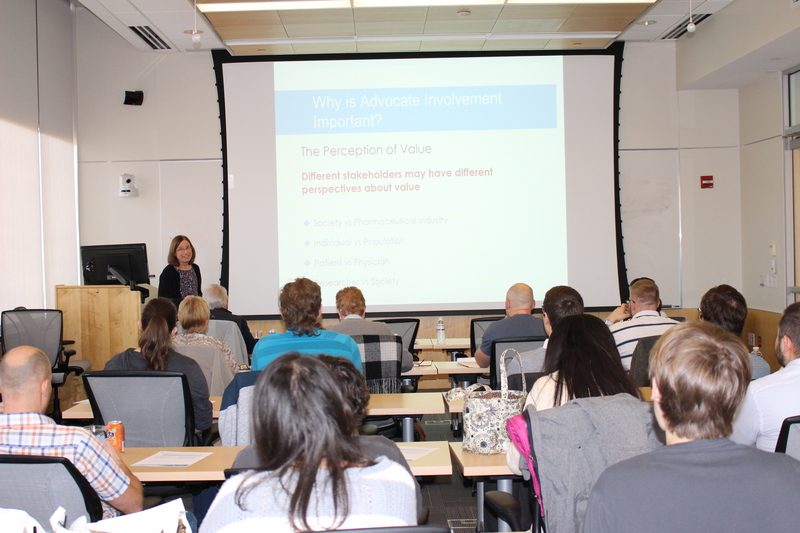 Patty Spears spoke to UNC Lineberger postdoctoral trainees about the value of incorporating the patient perspective into research. With the goal of helping young researchers improve how they communicate their findings to a lay audience, members of the UNC Lineberger’s Patient Research Advocacy Group last week attended and critiqued scientific presentations by postdoctoral trainees. In addition, Patty Spears, a breast cancer survivor and member of the group, known as P-RAG, spoke to the researchers about the importance of incorporating the patient perspective. She described ways that patients can be involved across the research pipeline — from participating in the early proposal stage of basic science funding applications, to clinical trials. “Engaging patients as key stakeholders is important,” Spears said, before introducing other members of the group, and asking them to share their stories. This was the first of what is planned to be monthly sessions designed to help scientists and trainees to consider the human element of cancer when conducting and presenting their research, and to instill a sense of responsibility to the public The postdocs presenting research at the inaugural session included Alicia Koblansky, PhD, who works in the lab of Jenny Ting, PhD; and Andrew Spracklen, PhD, who works in the lab of Mark Piefer, PhD. Still in the development phase, the program also intends to connect young researchers and patients for grant submission requiring patient advocates, lay abstracts and translational potential.